The summer to most people is the perfect time to grill and some people went further and described or better still named it “The Grilling Season”. In this season, there are only a few things that beat the great aroma of cooked barbecue food, the smile on the faces of your loved ones be it your parents, grandparents, siblings, partner and friends during a backyard cookout made possible by a great chef with the aid of the best charcoal grill. Meat grilled in a charcoal grill gives a sensational smoky flavor that can’t be found in other kinds of grills. There are many different types of charcoal grills with a variety of features to offer and to give you a great grilling season. 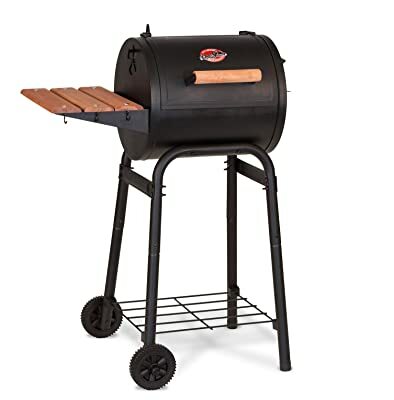 Here you will get to read about few charcoal grills which are the best models money can buy and save you the trouble of browsing through so many products. We will be showing you various advantages and disadvantages of some charcoal grills, how to select and then buy the very best charcoal grill that suits you better. The following carefully selected charcoal grills are the best products of different brands available. 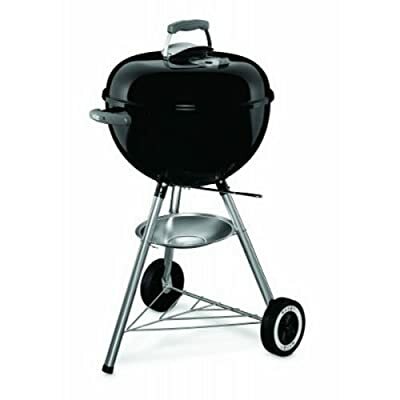 This Weber 441001 is a grill made of steel that comes with a 240 sq. in. of cooking space. It has a one touch cleaning system and also has a leg that is made up of resistance aluminum which prevents rust. Its cooking grates are made of plated steel. The bowl and lid are porcelain coated which baked at over 1500 degrees. It is 18-1/2 in. long, 35 in. high and 23 in. wide. This grill is an ideal size for a gathering of about three to four. If you plan to have a larger gathering, this grill is probably not for you. You can order for a larger model. If the number of people it can serve at once is not an issue for you then this is a great grill to have. It also comes with a 10 years warranty. This portable grill with 250 sq. in. cooking space has a compact body. What makes it different from other grills is because it has a traditional frame that comes with grills instead of the short models. It is made of heavy steel which gives it a long durability with an addition of cast iron to prevent rust of the cooking grates. It also comes with a side drawer that you can slide out to add charcoal or to remove ash. The Patio Pro is an excellent option if you have a limited space and it can only serve the gathering of not more than 4. It also comes with a small shelf that you can use to hold utensils or food. The grates provide a sound foundation for vegetables and meats. This is another Weber product that made the cut as one of the best grills. It offers a 363 sq. in. that can host sausages, chicken, steaks, and hamburger cooking space. 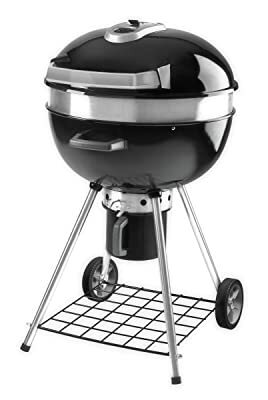 This is a grill that can host a large gathering; it is an ideal size for a large family. It is also rust resistant with a heavily plated steel grates. One of Weber distinguish function is its one-touch cleaning system. By turning the cleaning system the blades will displace the whole ashes and the little charcoal that remains out through the air vents at the bottom of the grill in the ash catcher. Vents are on top and bottom of the grill making it easy to control the flow of air and temperature of the fire. This also comes with a ten year warranty. The Napoleon is designed with a nice touch that has a 350 square inch cooking platform. Its surface area can take more than fifteen burgers at a go. The cooking grate is a bit high as a result of this, it is quite easier to add gas whenever the need occurs. Food can also be easily reached not minding where you are standing. The hook on the lid and the grill being quite handy made the access possible. This Napoleon model boost of a built-in temperature gauge, it makes it easier to track the internal temperature of the grill when you are cooking on the grate. On the final note, this Napoleon also has a decent ash catcher making it easier to clean the grill when you are done. This is also another inventive display from Char-Broil. Its sleekness and cool features are forces to reckon with, from the ash catcher been removable to using lesser charcoal compare to others. It also has temperature monitoring devices. The cooking grate is also coated with porcelain which prevents it from flaring up and it also holds the food on top. It is a 360 sq. in. cooking space grill with a considerable highest of 38.8 in. and width of 25.8 sq. it also boasts of an air inlet of 360 degrees, giving it control over the ventilation of heat. It has one major downside though, it cannot shutdown. It also comes with a warranty of 10 years. This is also another nice portable grill for people with limited space or someone who simply prefer a small grill. 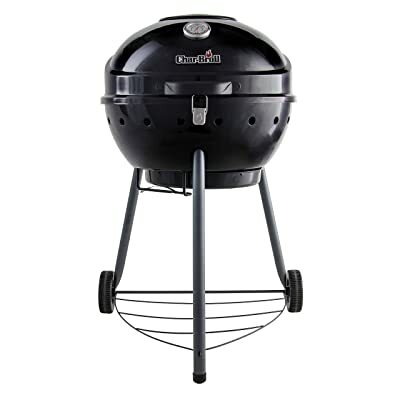 Its size doesn’t prevent it from being one of the best grills especially if you are on a budget. The cooking grate is built with cast iron having 250 sq. in. cooking space. It also comes with an offset fire box which can be used as a smoker but you cannot use it as both at the same time. It also comes with an ash catcher that is removable. It has some downsides though, like the paint coming off when the grill is heating at over 500 degrees and sometimes, you can discover that the fire box is leaking and it is easy to fix. It is also suited for a small gathering of less 4 people. This grill has a large cooking space of 793 sq. in. it is so big that itcan hold not less than 30 burgers at a whole. It is built to withstand heavy materials and it also boasts of a base rack for stockpiling and it also has a wheel that allows you to move it. One of its remarkable components is its steel construction which gives it a very long durability. 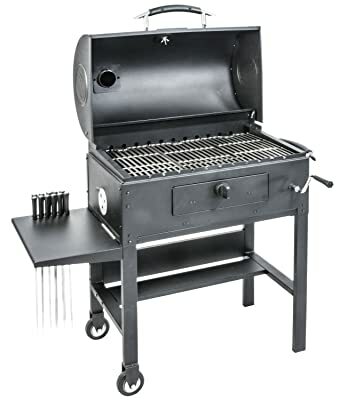 The temperature control system of Kingsford GR1031-014984 Charcoal Grill is so nice that you don’t need to be an expert to operate it, the thermometer that comes with it is very accurate and it takes cares of any doubt about the temperature you might have. It is great for cooking, grilling and for smoking. It is one of the perfect choices for a large gathering. Lastly, it has side shelves and it’s also with a base storage rack which allows you to store food. Though it’s not sleekly, but it gets the job done. This kabob charcoal grill is like a mini kitchen, it has a large space whereyou can do your grilling and cooking. One of its outstanding features is that it has a built-in rotisserie system which means you cannot only grill but also roast. You can also see it having a compact lid and also a mesquite that is adjustable which you can also use to smoke meat. It also features a temperature control system with an inbuilt thermometer. Furthermore, this kabob grill has vents that can be adjusted to your preference. As the name suggest, this is a versatile machine that can kabob, grill and smoke. Despite all these great features, it also comes with downsides. The rotisserie cannot operate without electricity; you need an extension before you can use it. 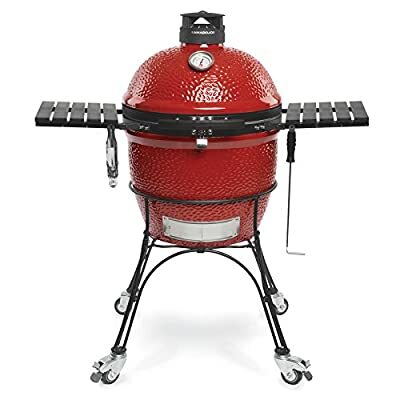 Kamado Joe Classic II Freestanding Grills is one if not the best kamado grills. This boost of fiberglass case wire mesh that is durable and has a seal that is air tight. The control tower vent is casted with aluminum which makes the lid to be easy to lift. It also includes heat deflectors for both direct and indirect grilling. It also has a system of cooking that allows you to cook separate foods on a different surface and levels. You can just have enough of this grill; it also has a hinge that can be airlifted and reduce the weight of the dome by 96%. It also boasts of the firebox with multi-panel that can eliminate breakage. It is casted with aluminium all around it. This is one of the best grills that you can get. Despite having many features, it is still easy to use. This Weber charcoal grill is just too extraordinary but comes at a price. It is one of the most expensive grills out there; with its capacity and feature, you will definitely get the value for your money. 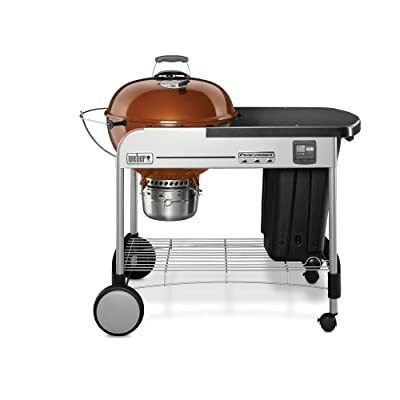 This Weber comes with an extensive table BBQ system cooking grate, and an advance clock. You can perform different cooking styles on this grill. It has a 363 sq. in. of cooking surface; the space is actually pretty decent. Weber Performer Premium Charcoal Grill is made of an aluminium grate that will last for a quite number of years and the handle is made of glass which is always cool even when cooking. The thermometer is inbuilt; this means you don’t have to disturb yourself checking if the coal is still hot. 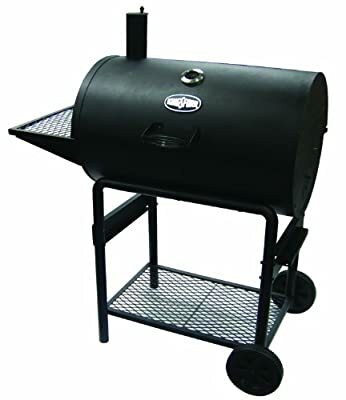 It has a storage unit that keeps the charcoal useable for a long time and it also an electronic ignition system. If you can afford it, this is actually a great grill to own. The charcoal grill generally is used for a slow cooking experience where the food is cooked by heating it with charcoal as the source of heat from below. Here are some benefits of a charcoal grill. High Temperature – The temperature can be as high as about 700oF. the fire temperature is higher when compared other grills. Food is properly and well-cooked on the inside too because the food is even more exposed to better heat. For all steak lovers, it is only the charcoal that can assure you perfectly crispy outer layer or exterior with a red center. Great Taste – Generally, people who love barbecues would rather opt for a charcoal grill because they feel that the distinct flavor and taste that is gotten from grilling your food on a charcoal grill, can never be achieved on a gas or an electric grill. Preserves Nutrients – Food nutrients such as vitamins, proteins, and minerals available in the food remain untouched and therefore the end product is nutritiously better. Furthermore, the fat found in the meat is separated from the meat when it is under a slow and continuous exposure to heat as a result of this the fat melts away and excess fat is gotten rid of. 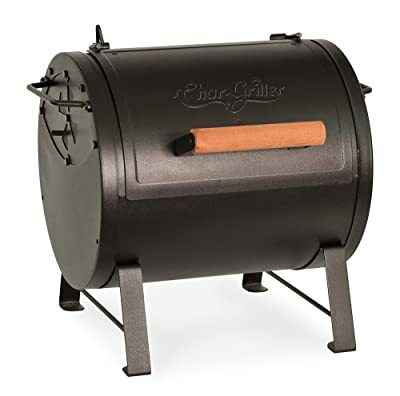 Portable and Cheaper – If you are the type that loves grilling in different locations and really want to spend less, this is what makes the charcoal grill more advantageous than other grills because it’s quite cheap and you can take it to the campground, park, the beach and avoid the backyard every time. Although the charcoal grills have so pretty good advantages, we can’t disregard some of its disadvantages as well. A few of them are listed below. Dirty – The charcoal grill can be too dirty whenever it’s in use and for someone whose first priority is cleanliness shouldn’t be considering a charcoal grill. This grill can get really messy even with a lot of ashes and needs a serious clean up after you are done grilling your barbecue. Waste Time – Charcoal grills are slow and also take a longer time to acquire the expected temperature. It is not also easy to light the coals, as it requires a lot of manual effort and it takes up to twenty minutes for the temperature to reach the required degree.It is agreeable that whenever the charcoal grill is in use, the temperature of the grill can’t be easily determined and also can’t be reduced or controlled by a first timer. The charcoal grill is not user-friendly because it is known for its occasional flare ups which can be quite dangerous. Health Problem – The use charcoal grill creates an emission which is not just environmental friendly alone but it also emits toxic smokes hazardous to human health. The continuous emission of smoke from the grill can be hazardous and a prolonged exposure may lead to breathing problems. There are so many factors to be considered when buying or choosing a charcoal grill as there are different types of people with different kinds of priorities. The size and the surface area are one of the most important factors to be considered when choosing the best charcoal grill. Firstly, you have to decide how big you want your grill to be and if it’s a small charcoal grill you need to take to a friends’ place or camping, something quite portable and not heavy is what you will need. The surface area meant for grilling is also another pressing concern that must not be overlooked. Typically any size of cooking or grilling surface is enough for not more than four guests. Well, if it is a large backyard cooking you’ve got in mind whereby you are planning steaks for about 25 or 35 guests at once, trust me you will be in need of something relatively large. Don’t worry because most brands provide information as to how many burgers fits the surface area of their products. The durability of a charcoal grill is actually a function of a strong brand with a good reputation, so spending a bit more on quality is an assurance you won’t have to spend unnecessarily trying to buy another grill for some years but you could buy another probably as a gift or an extra. When buying a charcoal grill the quality of the materials and how it was constructed are the right keys to watch for when buying a charcoal grill. Most grills with poor material quality and also poorly constructed fall apart easily and they don’t last long. If a quality charcoal grill is properly maintained and taken care of it is expected to last many grilling summers. Most grillers have always preferred a charcoal grill with some level of temperature control as it gives room for more precision while grilling. Therefore, acquiring a grill with tight lid fittings irrespective of the model or brand is highly necessary for a proper temperature control. the dampers available in all grills generally, allows oxygen in while the second one is for exhaust and they both influence the level of temperature control. Some larger charcoal grills do have an extra dampers or vents which can add to the level of heat control of a grill. An adjustable option available in some charcoal grills helps you set the coals from the grilling surface. This option helps set and create a level of temperature or heat control at which the food will be exposed to. Some features are created in a way that it makes grilling easy and cleaning less stressful. 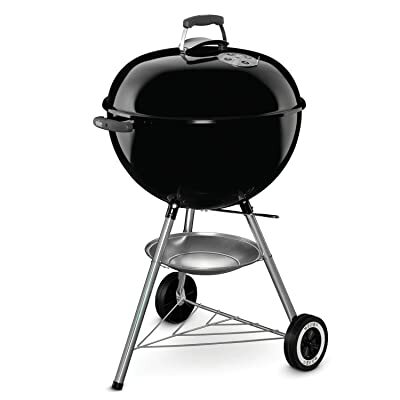 There are few grills manufactured with an extra hinged grilling grate that makes adding extra charcoal without lifting the barbecue on the grill. While the grills with ash catcher help in cleaning and grill maintenance just by pull out the ash tray and dumping it in a refuse or simply flip the ash catcher in some other brands and then the ash is gone. The following features and accessories are one of the major factors required when choosing the best charcoal grills. grates; the grates generally available are the ones made from the stainless steel iron and porcelain cast iron but the porcelain cast iron grate is known to last longer than the steel counterpart. different sections; there are few charcoal grills that offers a larger cooking surface with different sections so you can cook or grill different items with varying levels of heat at the same time, or a section can be used when grilling for few number of people. adjustable; there are grills with adjustable options that adjust or helps set the coal distance from the grilling surface. thermometer; whenever you are grilling with coal as the source of heat, the temperature needs to be right for a perfect and precise grilling. here, thermometer helps tracks the level of heat for proper control. ash catcher; the removable ash catcher help to ease the disposal of the ashes during grilling and makes maintenance and cleaning less stressful. Charcoal grills brands that have built their products and company name will definitely stand by their products by giving it a solid warranty. When grilling with charcoal grill it takes and needs a little patience than cooking on any other grills, but as a charcoal lover, it is agreeable that every effort is worth it. For those who have never used charcoal grill before, am so sure you will these tips so easy to follow and it will actually make you feel like a pro who knows what he or she is doing while grilling. The charcoal needs to be properly set and light before you start grilling and in order to get on with it, it is required of you to know how a fire could be set. Your coals must be stacked or set in a cone shape because this shape will give the fire enough oxygen it requires for it to catch fire. Some people may decide to use a lighter fluid and if you have chosen to do so, please use it cautiously and don’t use it on an existing fire. If there is no lighter fluid, some crumpled paper or newspaper precisely, with little kerosene will do the trick. Note please avoid the use of gasoline and a large quantity of kerosene because of explosion. The coal will need about 20 to 30 minutes for it to accumulate enough heat before the grill can be ready for work. When the coals are glowing with red heat and few ashes are found around the charcoal, then the grill is ready for use. Finally, knowing when to use the direct and the indirect method of heat application is highly necessary. When you are grilling a food that should take about 25 minutes to cook such as hot dogs, steaks, chicken breasts and the likes needs direct heat to cook and must not be turned frequently so as to prevent it from drying out quickly. Applying direct heat to food that needs longer time to grill for example food like pork loins, whole chicken or fatty foods generally, these foods will definitely get burnt on the outside and on the inside remains uncooked or undercooked. Just know that fatty foods and food that takes a longer time to grill or cook requires the use of indirect heat. Times when the summer light shines bright blessing the day, the backyard always seems to be the busiest place and the right place to get the party started. As far as all grillers are concerned nothing beats the taste and flavor of a charcoal grilled food, even the smoke and aroma serves as a beacon to all fun lovers. With all this information I’m so sure there’s no doubt in your mind as regards what suits you best. All you have to do is buy one and have a lovely grilling season.